Once the stack is created, complete the following steps. Navigate to the stack Outputs tab. 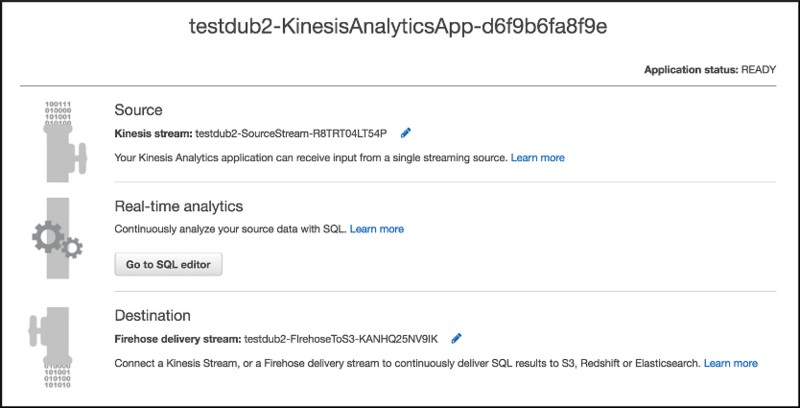 Note the name of the Amazon Kinesis Data Analytics application. Navigate to the Amazon Kinesis Data Analytics console. Select the name of your Kinesis Data Analytics application and choose Application Details. To view your data schema, select the pencil icon next to the source Kinesis stream, and scroll to the bottom of the page. Under Real-time analytics, choose Go to SQL editor. When asked if you want to start the application, select No, I’ll do this later. Review your SQL code and edit as necessary. Then, choose Save and run SQL. Your Amazon Kinesis Data Analytics application will change to a Starting state. Your application will start after 30-90 seconds.